April 2015 n Performance & Hotrod Business n 67 1. 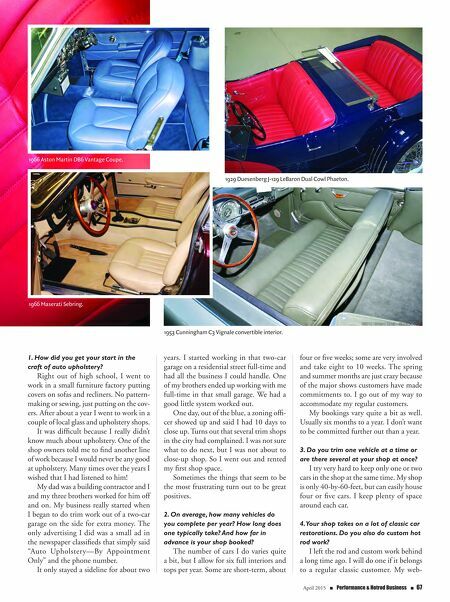 How did you get your start in the craft of auto upholstery? Right out of high school, I went to work in a small furniture factory putting covers on sofas and recliners. No pattern- making or sewing, just putting on the cov- ers. After about a year I went to work in a couple of local glass and upholstery shops. It was difficult because I really didn't know much about upholstery. One of the shop owners told me to find another line of work because I would never be any good at upholstery. Many times over the years I wished that I had listened to him! My dad was a building contractor and I and my three brothers worked for him off and on. My business really started when I began to do trim work out of a two-car garage on the side for extra money. The only advertising I did was a small ad in the newspaper classifieds that simply said "Auto Upholstery—By Appointment Only" and the phone number. It only stayed a sideline for about two years. I started working in that two-car garage on a residential street full-time and had all the business I could handle. One of my brothers ended up working with me full-time in that small garage. We had a good little system worked out. One day, out of the blue, a zoning offi- cer showed up and said I had 10 days to close up. Turns out that several trim shops in the city had complained. I was not sure what to do next, but I was not about to close-up shop. So I went out and rented my first shop space. Sometimes the things that seem to be the most frustrating turn out to be great positives. 2. On average, how many vehicles do you complete per year? How long does one typically take? And how far in advance is your shop booked? The number of cars I do varies quite a bit, but I allow for six full interiors and tops per year. Some are short-term, about four or five weeks; some are very involved and take eight to 10 weeks. The spring and summer months are just crazy because of the major shows customers have made commitments to. I go out of my way to accommodate my regular customers. My bookings vary quite a bit as well. Usually six months to a year. I don't want to be committed further out than a year. 3. 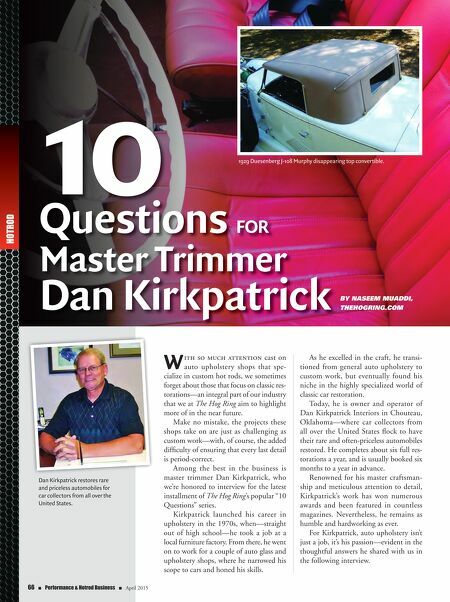 Do you trim one vehicle at a time or are there several at your shop at once? I try very hard to keep only one or two cars in the shop at the same time. My shop is only 40-by-60-feet, but can easily house four or five cars. I keep plenty of space around each car. 4. Your shop takes on a lot of classic car restorations. Do you also do custom hot rod work? I left the rod and custom work behind a long time ago. I will do one if it belongs to a regular classic customer. My web- 1929 Duesenberg J-129 LeBaron Dual Cowl Phaeton. 1966 Aston Martin DB6 Vantage Coupe. 1966 Maserati Sebring. 1953 Cunningham C3 Vignale convertible interior.